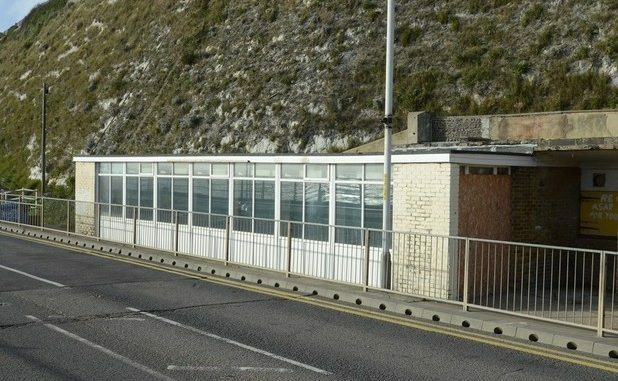 The Western Undercliff café and toilets has sold for £100,000 at auction today (October 29). A fundraiser was launched in July as part of a bid by The Hideaway – made up of members from the Western Undercliff Regeneration group – to buy the site from Thanet council as a community asset. But Thanet council placed the property with Clive Emson auctioneers and turned down a £50,000 bid from the group. The site had a guide price of £100,000 plus fees. The cafe has been shut since it was severely damaged in October 2014 as the result of the failure of the main Southern Water sewer. Following the clearance of contaminated waste from the site it was found that the foundation slab of the property had been fractured, damaging the structure of the building. Maxine Morgan, from the Western Undercliff Regeneration Group, attended the auction in a last ditch attempt to buy the site as a community venture for the group. The selling price was unfortunately beyond their reach. It is understood the site was bought by a property developer from Maidstone. It is not known what the developer’s plans are but Mrs Morgan says she has informed him of the community bid and exchanged phone numbers. This really is a kick in the teeth for all those local residents who actually wanted to restore this community asset for both the locals and visitors. Once again it appears TDC have shown how little they think of the efforts made by local people to restore the pride in Thanet. One can only hope the purchaser can come to some agreement with the Western Undercliff Regeneration Group and work in partnership with local people. This will no doubt be demolished and a block of “luxury” flats built in it’s place. You can pretty much guarantee it.